Samsung Galaxy S9 and S9+ have been the headline everywhere including the social media, recently they released the photo of the upcoming device, earlier today now here is another report which was revealed by a Reddit user. The leaked renders show a design which is in line with the earlier leaks. The upcoming flagships will feature smaller bottom bezels and will come with Infinity Displays. The fingerprint sensor of the new Samsung Galaxy flagships will be placed on the back, below the primary shooter. The Galaxy S9 will come with a single rear camera, while the Galaxy S9+ will flaunt two cameras at the back. The phones are tipped to arrive with Iris scanner and face recognition features as well. As for the specs, the source suggests that the Galaxy S9 will feature a 5.8-inch display bearing 1,440 x 2,960 pixels, while the S9+ will feature a bigger 6.2-inch screen with the same resolution. Both phones will feature IP68 certification for water and dust resistance, and will boot Android 8.0 Oreo out of the box. Depending on the region, the devices would be powered by either the Exynos 9810 or Snapdragon 845 chipsets. The Galaxy S9 will get 4GB of RAM, while the Galaxy S9+ will feature 6GB of RAM. The smartphones will come with 64GB of native storage, further expandable up to 400GB. They will feature an 8-megapixel autofocus selfie camera with an aperture of f/1.7. The connectivity features will include single and dual-SIM variants, 4G LTE, USB Type-C, Wi-Fi, Bluetooth 5.0 and A-GPS. The Galaxy S9 will be fuelled by a 3,000mAh battery, while the Galaxy S9+ will be equipped with a 3,500mAh pack. Talking about the rear camera, the Samsung Galaxy S9 will feature a single 12MP snapper with variable aperture settings, letting you switch between f/1.5 and f/2.4. The Galaxy S9+ will be fitted with a 12MP dual camera system at the rear. The main sensor will have a variable aperture of f/1.5 and f/2.4, while the second lens will feature an aperture of f/2.4. 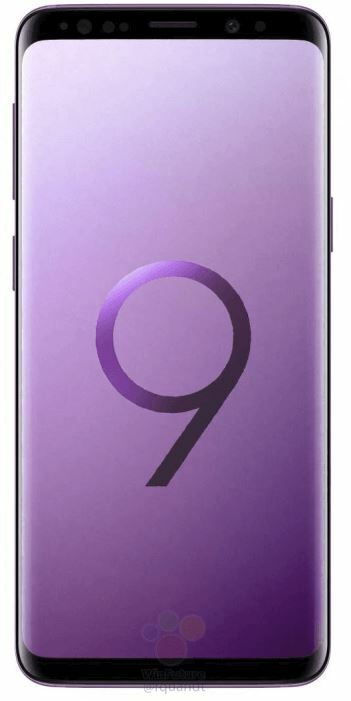 The tipster further suggests that the Galaxy S9 duo will be available in four hues at the launch – Midnight Black, Titanium Grey, Lilac Purple and Coral Blue. The pre-orders for the phones will kick off on February 25th, and they will start shipping from March 8th. In conclusion, Samsung will roll out and is going to trend more viral in the market judging with the photos and the specs released by the Samsung giant and leaked website.